An exam waiver letter is a written formal request where you ask the school or institution to waive your requirement of taking an exam or presenting the results. Its purpose is to help you ask for a waiver. To do it, you will have to write a compelling GMAT waiver request. You will need to include strong arguments that describe your request and substantial evidence to support your petition. 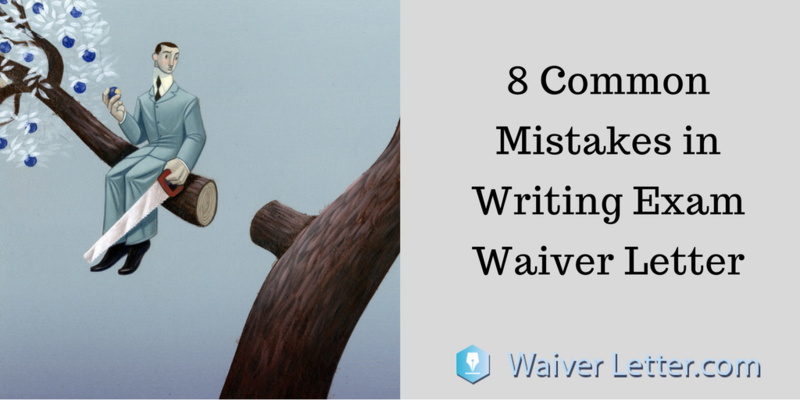 When writing an exam waiver letter, there are a few things you need to watch for. But for now, we will focus on the top ones. First of all, if you are writing a GMAT waiver request you will have to choose carefully the arguments you want to include in your letter. Explaining your professional background can help you in this case. Another thing you should watch for if the format you use. Bear in mind a waiver letter should include all the relevant information, but it should be brief. Thus, do not write a-thousand-words essay explaining why they should grant you that waiver. Ensuring you respect the reader at all times is another thing you should watch for. Remember to use formal language and acknowledge the person who will read your letter. You can simply do this by thanking them in your final sentence. There’s definitely a right way and a wrong way to go about writing an exam waiver. Whether you were unable to sit an examination due to illness or you simply feel that you already exceed the standards measured by such tests, you need to be able to write a highly polished GMAT waiver request to avoid them. Consider the commonly made mistakes here and make sure you don’t repeat them. When it comes to writing an exam waiver letter that can persuade and convince the reader to allow you to progress towards your goal without passing the test in question, you need to make sure that your work is word perfect. Take a look at the 8 most frequently encountered mistakes and make sure that you avoid them like the plague. If you were to submit a GMAT waiver request, for example, you should only do so if you have heaps of relevant work experience that makes such a method testing completely redundant. A big mistake many people make is that they write their GMAT waiver request without officially referring to the exact reasons why they are qualified enough not to need testing. You will need to provide your resume and official transcripts. You might know that you’re pretty much guaranteed to be able to have your test waived. For example, if you’ve completed the higher levels of CFA GMAT waiver success is highly likely. However, if you structure your letter such that it’s rambling, unfocused and generally does not do you justice, you can still end up having to take the GMAT. Research how to format your letter properly and you’ll be just fine. If you look at any good TOEFL waiver letter example, you’ll see that the writer does not boast about their skills and abilities. This would be exactly the right way to get off on the wrong foot, and instead, you should attempt to sound humble and respectful of your chosen institution’s requirements. Follow the approach taken by the best TOEFL waiver letter example you can find, and explain that you feel you deserve to have your test waived even though you respect it is a requirement for entry to your chosen course. Before you go ahead and write a full letter, make sure you know whether it is even necessary. A lot of people see the name of a test that they haven’t passed and jump to conclusions. They fail to notice that the test in question is actually just one opportunity for them to show their aptitude for the course they wish to study. To give an example, for those who have passed the upper levels of a qualification like CFA GMAT waiver attempts are much more likely to succeed. All success is achieved by plenty of prior preparation. Make sure that you take the time to use a technique like mind mapping in order to plan your approach towards your GMAT waiver request. If you take a little time now, you’ll save untold hours of studying for a test that could have been waived. In the modern day, it’s all too easy to get comfortable with writing to different people in a casual and friendly style. It’s become accepted even between unacquainted contacts in the business world, but the academic world is a little behind the times. Choose a writing style that is respectful, formal and yet still communicative. Despite it being highly likely that your GMAT waiver request will be read on a screen, you should still write it as if it’s a traditional paper-based letter that’ll be printed out and read at a desk. Even if you’re sending your letter directly via email or as part of an attachment thereof, you need to stick to the proper way of doing things. You should aim for your letter to be around 3 paragraphs long and you ought to focus on medium-length sentences that get straight to the point while retaining a degree of decorum. Writing too much or too little could result in your application being rejected without the due level of consideration that you’d expect. These top tips should help you to approach your exam waiver in the right way. Persuasive and evidence-based arguments will get you onto the course of your dreams and our writers are ready and waiting to show you exactly what to do. If you’re struggling with writing the content of your letter, you can easily hire a professional writer to help you reach your goals. We offer waiver help for all kinds of exams, including GMAT, TOEFL, CFA, GRE, ACT, PET, SAT, and IELTS. We have listed five tips to help you write an exceptional exam waiver letter. Make sure you write them down and keep them near you when writing your letter. First of all, search for a waiver letter sample written by a professional writer. Using a TOEFL waiver letter example, or any other type of waiver sample can help you with your writing. The second advice is to take good care of your language. Use formal language to express your arguments and mind your words. The third advice is to use a basic structure when writing your waiver letter. This will help you make sure the reader understands your message. The fourth, describe why you are requesting that waiver. Use strong arguments. And the final advice is to thank the reader at the end of your letter. This will give it a personal touch that the reader will appreciate. If you want to ensure your exam waiver letter is well-written, do not hesitate to contact a professional writing service – this is additional expert advice that will help you avoid all the troubles that come with writing a waiver letter. A professional writer can help you write a compelling waiver letter according to your needs, and make sure it is flawless. Plus, a skilled writer can link persuasive sentences coherently to convince the reader. How Can Our Expert GMAT Waiver Request Writers Help You? Our expert team of professional waiver letter writers is here to help. They can help you write any waiver letter you may need. From CFA GMAT waiver letter to English language test waiver letters, there is nothing our skilled team cannot do. Our professional writers will write your GMAT waiver request according to your requirements and need. Plus, they will revise it as many times as you wish to ensure it is perfect. Make sure you get professional help with your exam waiver. Take expert advice and boost your chances of getting onto the course of your dreams!